Our quality teams work closely with laboratories that are certified, accredited and recognized by the European Commission. Each production run is subject to strict quality controls by both our product teams and the manufacturers themselves. All of our products comply with European standards . Each product meets specific requirements in terms of its nature, its function, its constituent materials and the age of the child for whom it is intended. Designed in France , all our products are created especially for children. That’s why we strive to use only the highest quality materials and finishes on all our products. We quality check all of our designs carefully; testing zips, drawstrings, embellishments and accessories. 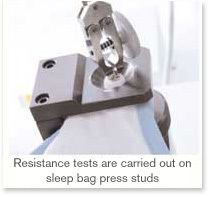 All our buttons and press-studs undergo stress tests at different stages of production. Seam strength, colorfastness and the verification of the size and fit of items are also tested in approved laboratories . To prevent irritatation of delicate skin, the labels in our T-shirts, underwear and sleep bags are printed in water-based ink instead of sewn. Our bed linen is made using hard-wearing pure cotton (57 threads/cm2) that is tested for both colourfastness and durability when washed at 60°C. No azo dyes are used in our bed linen or sleep bags in accordance with European regulations. Sleep bags are made with reinforced press-studs and zips and fastenings that have been subjected to the proper pull tests . We also take great care to ensure that all our products include comprehensive washing and care instructions. We use only the highest quality materials in the manufacture of our furniture, choosing traditional solid woods such as rubber or pine for their durability and natural appearance where we can. Choosing these woods also has an environmental advantage as they do not require any chemical treatments or finishes that may be harmful to the environment. 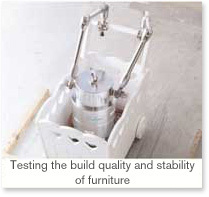 When we do use MDF, it is of E1-standard which has extremely low formaldehyde emissions. We test all the paints, lacquers and varnishes we use in the production of our furniture for non-toxicity and ensure that they all meet European standards . We use NC (nitrocellulose), cellulose (made from plant fibres) and Epoxy paints and lacquers for long-lasting color and surfaces that are resistant to scratches and knocks. 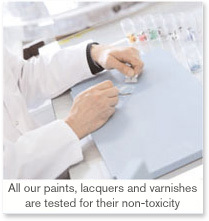 These lacquers also contain less than 2% solvent, making them less harmful to the environment . The packaging our furniture is supplied in is tested for its suitability to properly protect the contents and withstand bumps and knocks. 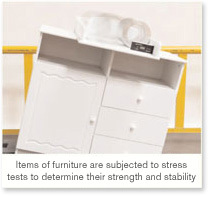 Items are also subjected todrop tests to ensure they can stand up to wear and tear . To simplify the assembly of our furniture, we are constantly developing and refining our build instuctions to ensure they are clear and easy to understand. Our quality teams work closely with accredited laboratories across Europe to rigorously test all our products, and to ensure that they conform to current safety regulations . All items from the Vertbaudet nursery range have been designed and tested in laboratories approved by the French Ministry of Industry before being put into production. Strict quality control checks are also made upon receipt of items in our warehouses to ensure items are not damaged in transit. Carefully read any operating or assembly instructions before use. Ensure your child’s room is well ventilated to eliminate any odors from new furniture. Do not place furniture near a window to avoid the risk of climbing or falls. Beware of pre-loved or inherited objects that may no longer conform to current safety standards. All the paints, varnishes and lacquers used in the production of our toys are lead-free and non-toxic , meeting the European safety standard EN 71-3 which guarantees the absence of heavy metals that may be harmful to health. All our lamps are compliant with current safety standards and are supplied without bulbs as an extra precaution. Our lighting range is resistant to falls of up to 80cm, reducing the risk of your child swallowing small parts. They are also all equipped with a safety guard at the top and bottom of the shade which prevents children from accessing the lightbulb, and a low voltage transformer to minimise the risk of burning. For your child’s safety, always use the correct bulb wattage as indicated. Vertbaudet is committed to reducing environmental impact in all stages of manufacturing, and has an ethical commitment to employees involved in the production of our products. We have appointed an audit firm to ensure that all our suppliers adhere to international labor laws governed by the International Labour Organization that covers working conditions, health and safety and the minimum age of employees.